I have just returned from observing a meeting of Cambridgeshire County Council’s cabinet where the decision was taken to increase Cambridge’s on street parking charges. The cabinet approved raising the annual charge for residents parking permits from around £40-50 to £70-£80. On-street pay and display charge increases were also approved, a typical change being where 50p buys 15 minutes at the moment, in the future it will only buy 10 minutes. The pay and display charge increase is expected to raise an additional £235,000 per year. That’s £235,000 of additional tax being taken out of Cambridge’s economy, out of the hands of Cambridge’s residents and businesses. I thought it notable that the city centre management organisation, Love Cambridge, had not opposed, or even commented, on the proposals. It doesn’t operate in an open and transparent enough manner for me to be able to work out why that’s the case, but it does suggest to me that it is not exerting the influence it could be having. I spoke to leader of the council Nick Clarke briefly before the meeting and complained about the lack of democratic accountability and localism in the decision making as no Cambridge councillors are members of the committee taking the decision, and the mechanisms which exist for devolving power to local levels – the Traffic Area Joint Committee, and the Area Committees not being used. When the item on Cambridge on street parking charges was reached three councillors from Cambridge, Cllrs Whitebread, Harrison and Sadiq addressed the committee. Cllr Harrison said the moves were taking residents parking away from being a service, the costs of which were covered by the charges, to a tax. She urged the cabinet members to take account of what the local elected representatives were saying, as it was a matter “beyond the experience of cabinet members”. Cllr Harrison was rather defeatist saying she didn’t think she had any real hope of changing the cabinet members’ minds on the increase in charges, but she wanted to put forward an idea for improving the scheme and called for half day permits to be made available for visitors. Cllr Whitebread made a confused and internally inconsistant speech. She like Cllr Harrison argued the scheme should only cover its costs, but also said that those living in areas where the controlled hours for residents parking are longer should pay more. This was especially odd as those areas with the longest controlled hours, those she wants to pay more, are mostly her Market Ward constituents. Cllrs Harrison and Whitebread both argued against drawing any parallel between pay and display charges and the costs of residents permits, though I felt this was undermined by Cllr Whitebread saying residents permit charges should relate to the number of hours the scheme is in effect for. Cllr Sadiq said there were no residents parking zones in his ward at the moment, but that the way the decisions were being taken in relation to them might put people off wanting them if they became required. Councillors said that the Traffic AJC had proposed distributing the increases more evenly around the city. Council officers sitting next to me in the public seating said that they had thought this was a good idea and had supported it themselves. Cabinet member Cllr McGuire defended the proposals saying they amounted to a 17-24p per day increase for residents parking permit holders, which he said was cheap compared to pay and display prices. He argued the increases in both areas were needed to prevent a deficit. Cllr Rosensteil was present in the public seating. He did not speak (I suspect he was not permitted to), but Cllr McGuire specifically objected to to something Cllr Rosensteil had written in his representation – that the Traffic AJC’s suggestions had not been considered. Cllr McGuire said there was a statement in the minutes of a cabinet meeting saying that they had been considered [but rejected]. “they will go up all the time”. Oddly Cllr Clarke described the decision as “localism at its best”. I cannot how he imagines that can be a fair assessment of what’s happened. After hearing from the Cambridge councillors, and clarifying what they had said. There was no debate among cabinet members before they approved the raise in the charges unanimously. we cannot refuse to issue nor rescind a permit because the applicant is a student. 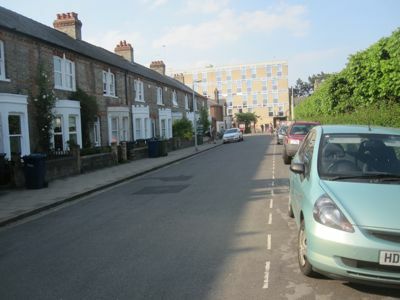 I have written an article on on-street parking permits for students in Cambridge. Other aspects of the County Council’s running of the scheme include the fact they don’t appear to be in-touch with the City Council over which properties are eligible, so if the City Council makes a giving planning permission for building on a parking space conditional on that property losing the right to an on-road parking permit the County Council apparently won’t take any notice. The reception desk for the parking scheme is based in the Central Library, and proposals have been floated for closing the library earlier in the evenings, presumably also affecting the in-person service. I thought this would be an appropriate place to note that I am appalled by the approach the Liberal Democrats are using in the De Freville Avenue area to try and push resident parking zones there. As they now appear to do with all sorts of areas, they having had a response to a consultation which went against their proposals they are consulting again and again with an ever more selected group of people until they get the answer they want. I see the Cambridge News letters page (which isn’t online but I occasionally see in a physical copy of the paper) has been full of letters, largely complaining about the city council pushing the scheme. My own view is that a parking problem has to get really very bad indeed before it is worth giving up the freedom to park in an unrestricted manner on the road. Especially unless / until we get real local democracy you never know what changes to the rules and increases to charges will be made once the state starts to interfere. I personally live on a street in Cambridge used for commuter parking. My own car is currently parked a street away because there was no space on my own street and I’ll go and get it later (something which happens even where there are residents permits). I wouldn’t want to see a residents parking scheme introduced where I am (one bonus about living here to me is the unrestricted parking) though I can see the need for it is higher closer to the city. One thing I would like to see is my local councillors speaking to those who try and prevent others parking outside their properties, eg,. by blocking spaces with bins and/or complaining at those who park in what they see as their spaces. That kind of thing is a real, regular, but low level nuisance. My brief exchange with Cllr Clarke outside county hall before the meeting started was interrupted by happy education protesters from Gamlingay congratulating Cllr Clarke on how amazing he is and how he listens. The start of the afternoon session was delayed as Cllr Clarke spoke to the BBC TV news and others outside the main entrance of the County Council building, presumably about a positive decision taken in relation to education in Gamlingay. “we don’t provide bus services, what you must be talking about is a cut to the subsidy, given what you’ve said about how well used the service is I hope the service will be commercially viable”. Cllr Clarke then brought the item on Cambridge’s parking charges forward and took that next, in recognition of the fact a number people were present to observe that item. There is an anomaly in what householders can do if they need to ‘reserve’ the space outside their home for a delivery or removal van or similar. In a CPZ (Controlled Parking Zone) they can ask to have the bays suspended and reserved for them. Outside a CPZ there isn’t anything you can do. Good. This is a ridiculous and iniquitous rule. Much better would be not to grant planning permission in the first place unless the new property adds adequate parking provision. Of course the bonkers Lib Dems on the city council are incapable of understanding this. On parking charges, the principle of residents’ parking is that the charge should pay for the service and that’s it. I disagree with hiking this charge any more than is necessary to fund the scheme itself. However, a positive side effect of increased charges with the prospect of further increases might perhaps be that people won’t fall into the trap of requesting it for their own roads elsewhere. I agree its bonkers to have some properties singled out as ineligible; but its not good the two councils involved are inconsistent in this way as it creates confusion. I think you misunderstood me Richard. My point was that, although I accept some difference in price based on hours (which we already have) I felt the distribution proposed was too uneven, and the more fairly spread AJC proposals would be better. So I was actually arguing for a decrease in the cost for Market residents. You maybe only heard the first half of what I said, or something. Cllr Whitebread, by accepting a difference in price based on hours you are arguing for your Market Ward residents to pay more. Yours was a different stance to your fellow party member, and fellow ward councillor City Councillor Rosensteil who argued, in his submission, for the fees for residents parking to be only linked to the administration cost of the scheme and to be completely independent of the number of hours per day the scheme is in operation for. That is the difference I am stressing, and that is where you were arguing against the interests of your constituents. No one was arguing for anyone’s costs to decrease from the current levels, everyone agreed the prices should increase so the costs of the scheme continue to be covered by the fees.